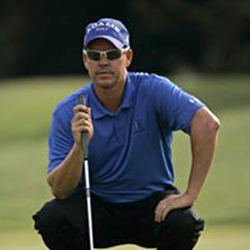 Brad Ott:	Hi, this is Brad Ott, Director of Instruction here at TPC Craig Ranch, McKinney, Texas. I want to talk to you about probably the most asked question I get from amateurs, how do you start the golf swing? I get this a lot. One of the things that I try to encourage them to do is to have as few moving parts as necessary. Over the years of playing on tour, one of the things that I started to notice is the best players in the world, when they start their golf swing it's a pretty simple, efficient movement pattern. One of the things my coach and I came up with is whenever the swing starts, it's really only one body component that moves it, and that's the torso. What I'll teach my students is, as they go back, they're right shoulder starts the golf swing. If we want to have a good path, we all know we want to work down this target line, this is our target line, the best way to do that is to just turn the right shoulder. You'll see the club work straight down the line. Where a lot of amateurs get off is they'll use their hands, they'll use their wrists, sometimes they'll lift their arms, sometimes they won't lift their arms. If you want the back swing simple, use your torso because we all know the very beginning of the golf swing, the first foot of the golf swing is going to ultimately determine where that golf club goes at the top of the swing. Once you get off in the beginning, if you get off the beginning, you're probably going to be off at the top. What I'll encourage you to do, is when you're setting up the shot, a little exercise I use to do, put my hand, my left hand on my right shoulder, and I would literally just push my shoulder. Once this shoulder goes back, you'll see the club work straight down the line. At that point in time, the club should work back on plane. You can do that little exercise. You can push the shoulder, push the shoulder, take your grip, take the same sensation of pushing, and you should see that club work straight down the line, and straight back trough the line. If you're struggling with your take away, and it's causing you to miss some fairways and greens, think about moving that shoulder back to start the golf swing. Try not to start with your hands. I think you're going to find out, you're going to hit more fairways.